Cassandra Chiu has been chased out of shops and restaurants, had taxis drive off without her and a drink thrown on her - all while going about her daily life like a normal person. Chiu began losing her vision to Stargardt disease at the age of eight and gets around with the aid of a guide dog, Esme. She is the first woman to become a guide dog handler in Singapore. Thus the brickbats, the bans and even the drenching, which she says occurred in a mall when an irate stranger threw an icy drink on her and Esme from above while they were going down the escalator and verbally abused her for taking a dog into the mall. 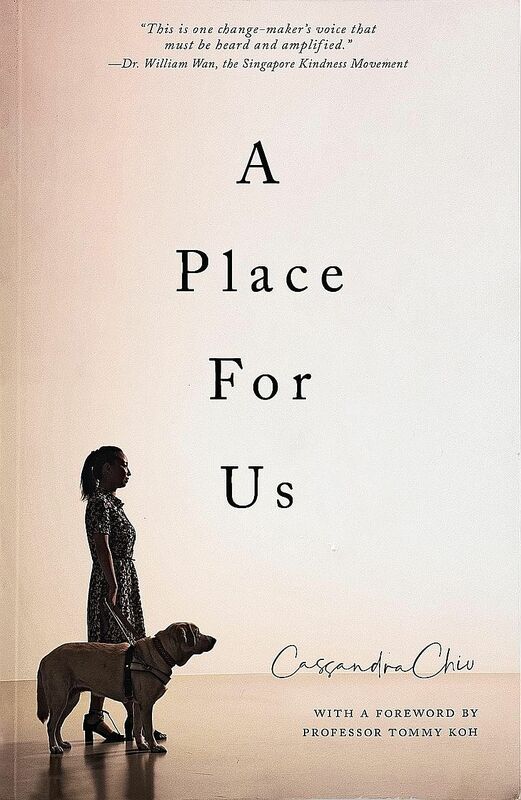 Chiu, 40, revisits these incidents in her memoir A Place For Us. "I didn't want to sugarcoat disability," she says. "I am opposed to the idea that a disabled person is special or inspirational because he or she can go to work or cook or put on make-up. "I want society to see what we can do, that we're not totally useless or helpless - we can do things given the right opportunities and tools. But we are also fighting to have a place in this world we share." The book was launched last Saturday in tandem with The Finger Players' inclusive theatre production, Not In My Lifetime?. According to its publisher Ethos Books, it is the first book in Singapore to be brought out simultaneously in paperback, e-book, braille and digital braille, which is read on tactile tablets that create raised bumps via a pneumatic system. Chiu, a psychotherapist and a single mother, took more than a year to write the book, waking up at 4am to write for two hours before taking her daughter, 13, to school. She uses text-to-speech computer software Jaws (Job Access With Speech). In the process, she had to revisit unpleasant moments from her past, including a 2015 incident at the Zara store at Takashimaya Shopping Centre, where she got into an altercation with a security guard who stopped her from entering with Esme and allegedly swore at her. After her Facebook post about the incident went viral, the fashion brand's Singapore distribution and retail arm apologised to her and the guard was removed from his position. She later retreated from advocacy, resigning from her part-time position at the Guide Dogs Association of the Blind. This, she says, was partly to protect the privacy of her family, especially her young daughter, from the backlash she was facing. At the time, she avoided reading comments on her post, but decided to do so for the book. Hearing online vitriol read out to her in Jaws' robotic voice at 5am "cut a lot deeper", she says. "I thought, is this what society wants for me? Because I'm blind, does that mean I don't have the right to go shopping after work?" There are eight certified guide dogs in Singapore, including Esme, who is 91/2 years old and will retire next month. Chiu has raised funds for a new guide dog, Elke, from the same Australian school that trained Esme. Esme, meanwhile, will go live with a friend as Chiu, who lives in a five-room Housing Board flat with her parents and daughter, cannot keep another large dog besides her guide dog. It will be a hard parting. "She has been there through the toughest period of my life," Chiu says. "We're symbiotic. A guide dog is not a white cane you chuck in a cupboard when you get home - it's a relationship." Over the eight years she has had Esme, she says there has been more awareness of the role of guide dogs - nowadays, young children who run up to pet Esme are told by their parents that the dog is working - but more can be done. In the book, she discusses how to make society more inclusive, from implementing more road design features such as audible traffic signals to increasing employment opportunities for people with disabilities. Last month, The Straits Times reported that only about five out of every 100 people with disabilities here are employed. Chiu says: "I hope that at the policy level, there will be more programmes to channel resources into quality rehabilitation for people with disabilities... such that they learn to function well despite the disability and that there will be help for them to be employed at a meaningful level and with appropriate compensation." She believes in a "social model", which empowers people with disabilities to make choices for themselves, over a "charity model" of simply giving. "When we see disabled people as objects of pity, we keep them in this 'helpless' box. "It's not about inviting them to the table and paying for their meals. It's about equity, about having everyone come to the table, share a meal and feed themselves."